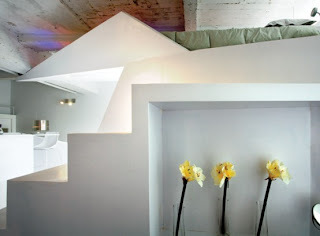 Design of this 49 sqm apartment in Barcelona gets its inspiration from Japanese origami art. One wall which separate all functions of the apartment made with this style in mind and that is enough. When the designer create the wall the apartment already had a shell of simple concrete walls. Some parts of ceiling are still uncovered so futuristic design also has rustic elements.